Rembrandt van Rijn revolutionized painting with a 3D effect using his impasto technique, where thick paint makes a masterpiece protrude from the surface. Thanks to the ESRF, the European Synchrotron, Grenoble, France, three centuries later an international team of scientists led by TU Delft and the Rijksmuseum have found how he did it. Impasto is thick paint laid on the canvas in an amount that makes it stand from the surface. The relief of impasto increases the perceptibility of the paint by increasing its light-reflecting textural properties. 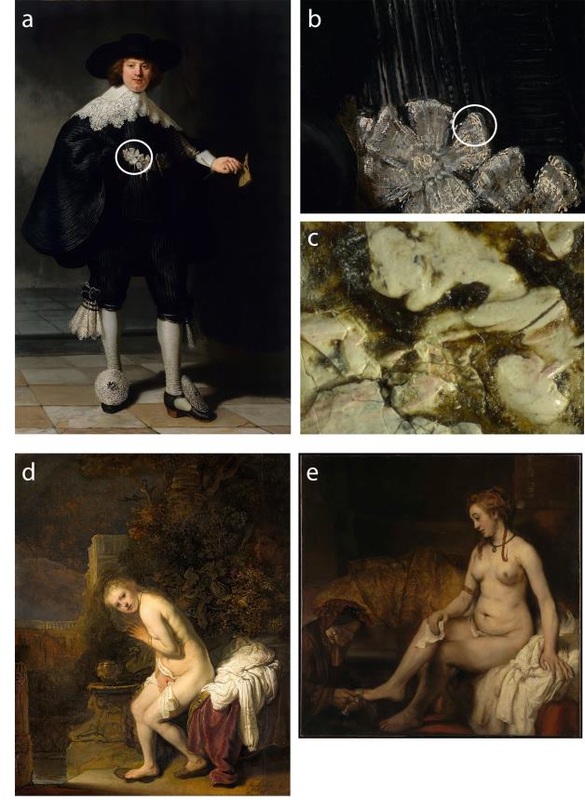 Scientists know that Rembrandt, epitome of the Dutch Golden Age, achieved the impasto effect by using materials traditionally available on the 17thcentury Dutch colour market, namely lead white pigment (a mixture of hydrocerussite Pb3(CO3)2. (OH)2 and cerussite PbCO3), and organic mediums (mainly linseed oil). The precise recipe was, however, unknown until today. Plumbonacrite, Pb5(CO3)3O(OH)2 is the mysterious, missing ingredient of the impasto effect, researchers from The Netherlands and France have discovered. It is extremely rare in historic paint layers. It has been detected in some samples from 20th century paintings and in a degraded red lead pigment in a Van Gogh painting. “We didn’t expect to find this phase at all, as it is so unusual in Old Masters paintings”, explains Victor Gonzalez, main author of the study, postdoc at TU Delft at the time of writing and now scientist at the Rijksmuseum. “What’s more, our research shows that its presence is not accidental or due to contamination, but that it is the result of an intended synthesis”, he adds. The European Synchrotron, ESRF, played an essential role in these findings. The team sampled tiny fragments from the Portrait of Marten Soolmans (Rijksmuseum), Bathsheba (The Louvre) and Susanna (Mauritshuis), three of Rembrandt’s masterpieces. Using the ESRF’s beamlines, they quantified the crystalline phases in Rembrandt’s impasto and in the adjacent paint layers, modelled the pigment crystallites morphology and size and obtained crystalline phase distribution maps at the microscale. The samples were less than 0.1mm in size, requiring the small and intense beam delivered by the synchrotron. The scientists analysed them on two ESRF beamlines, ID22 and ID13, where they combined High-angular Resolution X-Ray Diffraction (HR-XRD) and micro-X-Ray Diffraction (µ-XRD) . “In the past, we have already successfully used the combination of these two techniques to study lead-white based paints. We knew that the techniques can provide us with high quality diffraction patterns and therefore with subtle information about paint composition”, explains Marine Cotte, scientist at the ESRF, 2018 Descartes-Huygens Prize laureate for her research on art conservation. The analysis of the data showed that Rembrandt modified his painting materials intentionally. “The presence of plumbonacrite is indicative of an alkaline medium. Based on historical texts, we believe that Rembrandt added lead oxide (litharge) to the oil in this purpose, turning the mixture into a paste-like paint”, explains Cotte. The breakthrough yields the path for the long-term preservation and conservation of Rembrandt’s masterpieces. However, the number of samples studied is not extensive enough to assess if lead white impastos systematically contain plumbonacrite. “We are working with the hypothesis that Rembrandt might have used other recipes, and that is the reason why we will be studying samples from other paintings by Rembrandt and other 17th Dutch Masters, including Vermeer, Hals, and painters belonging to Rembrandt’s circle”, explains Annelies van Loon, scientist at the Rijksmuseum. In addition to this, the team will reconstruct specific impasto-like samples, preparing and ageing them under CO2 rich and CO2 free atmospheres (to assess the origin of carbonates in plumbonacrite) and in humid and dry conditions (to assess the effect of water). This work, led by the Materials Science and Engineering Department of the Delft University of Technology and the Rijksmuseum is a collaboration between academia (Institut de Recherche de Chimie Paris, Sorbonne University and University of Amsterdam), Cultural Heritage research institutes (C2RMF: Centre de Recherche et des Restauration des Musées de France), museums (Rijksmuseum and Mauritshuis) and the ESRF. Image: Some of the Rembrandt paintings sampled for this study: a) Portrait of Marten Soolmans, 1634 (210 x 135 cm), Rijksmuseum. b,c) Detail of the character rosette showing impasto. d) Susanna, 1636 (47.4 x 38.6 cm), Mauritshuis. e) Bathsheba, 1654 (142 x 142 cm), Louvre.